A question I was frequently asked (particularly when I was maintaining the Comp.Sys.Acorn FAQ) was that of how RISC OS, the default Acorn operating system and environment for most of their machines, looks and feels to use. This page is an attempt to answer that question. 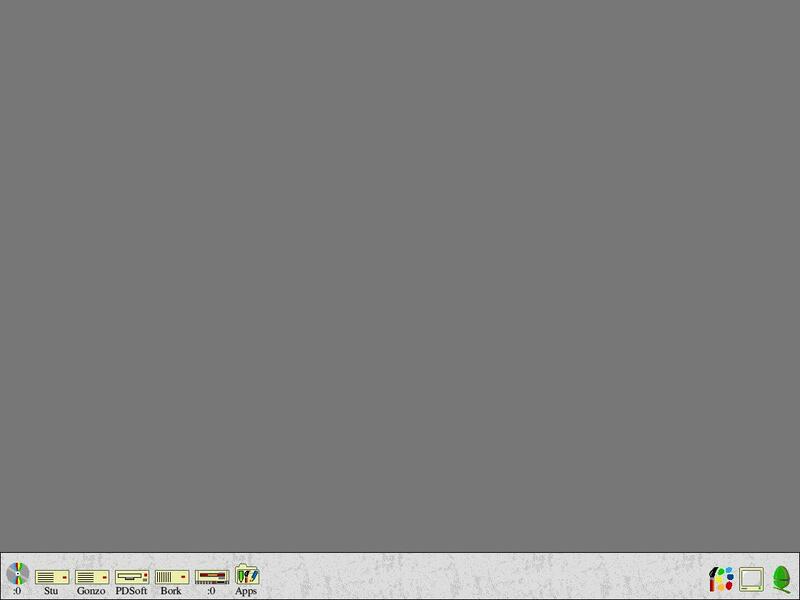 Here is, by and large, the standard desktop that I use. It is slightly customised above and beyond the default one but the majority of the changes are cosmetics like a nice backdrop and prettier sprites for the CD ROM drive. As well I run a few small accessory tasks that help with day to day use of the machine. The most obvious being the application dock running down the right side of the screen, above the icon bar, as well as a few tasks running. Namely a free memory display, file/application/directory 'memorizer' - very handy, a virtual desktop and an email/news unbatching program. The Alarm clock is a part of the standard application suite that comes with the OS. To see the bare bones unembelished OS looking at the default RISCOS desktop should highlight the level of customisation nicely. 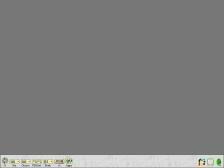 The primary feature of the desktop is the iconbar running along the bottom of the screen. 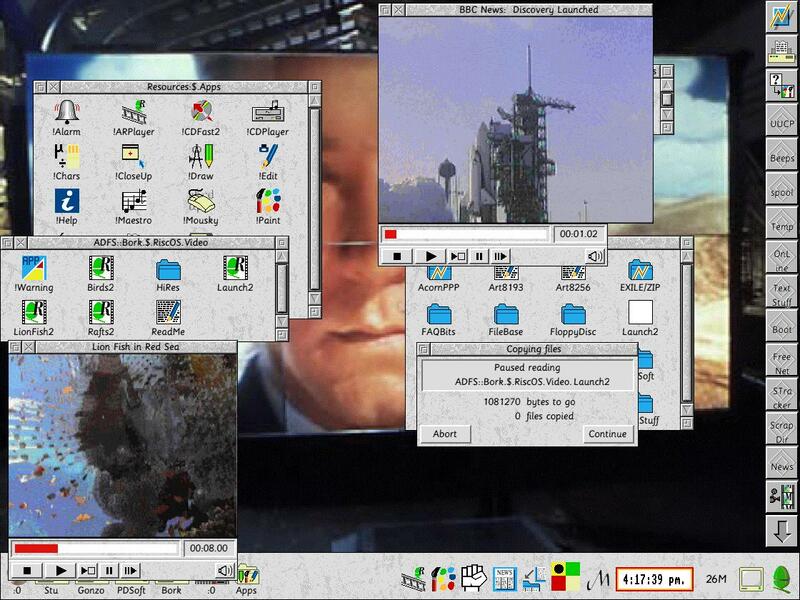 RISC OS, rather than having a textual list of task names alone, uses the icon bar to give you a graphical display of applications available for use and resident in memory as well as the general capabilities of the machines hardware. It is split into two major sections. To the left lie the hardware devices. In this case being a CD ROM drive, sundry hard drives, floppy drive, MO drive and the partly ROM based Resources folder. Each physical device gets one icon that allows you to control and manipulate it. 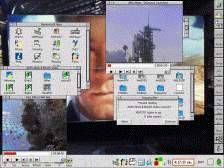 When Windows95 started to use a similar technique to the iconbar Microsoft dropped this side of the bar - prefering to use their bar for applications alone. It is something of a frustration for me when using WIndows 95 because I am so used to being able to quickly open up filer displays on the various devices and generally control them. It's primary benefit from my point of view is less desktop clutter. Because I can quickly reach most any directory on any device I tend not to leave filer windows open a lot. Rather I open them as and when required, placing really frequently used ones into my Application Dock to allow them to be a keypress away. That I find the dock system so useful does indicate that the system is not all it could be in terms of ease but it is true that I find the presence of the icons facilitate faster, easier and less cluttered (in terms of loose Filer windows lying around) access to the machines storage resources. It is worth noting at this point that RISC OS uses entirely context sensitive menus. Menu bars, while possible to provide, are frowned on and definitely against the guidelines of the RISC OS style guide. Clustered to the right of the iconbar, with two noteable exceptions, are the applications. Here the central icon of an application not only gives you a reminder that it is running but it also gives you a central focus point for configurations and choices that affect the application as a whole. Global configuration, brief task information and quitting the task are the most commonly available menu options from icons here. In no way is an application required to have an icon here and indeed many more background batch type tasks don't. But an application that the user tends to interactive with directly is unlikely to not have one present. Again the ease of seeing what important tasks are running in a graphical form come through, giving the user (especially once they become familiar with the tasks involved) a quick and easy way to gauge the level of system utilisation going on. However two icons are an exception to this in that they are not actually applications strictly, more that they are system management tools. These are the green acorn icon, which is system management, and the TV screen icon which is screen resolution and colour depth control. A closer look at what these two icons provide is featured a little further down the page. This is RISCOS doing various tasks. Replay, our equivalent of Quicktime, enables the playing of video sequences on the desktop. Currently, as of late 1996, it can only play one movie at a time and it halts multi-tasking while doing so. These measures were taken because Replay can function on older ARM2 machines which required the singular attention of the processor to keep the frame rate up. Now that we have faster processors, primarily in the 200 MHz StrongARM, and the older ARM2 machines are being slowly phased out these reasons are no longer critical. Consequently Acorn are due to shortly release a multi-tasking version of Replay reportedly capable of playing about six movies simultaneously without straining on a StrongARM. Also featured are the standard Filer Windows showing a mixture of applications and files. Finally a multi-tasking filer action window is shown paused in the middle of copying files around. 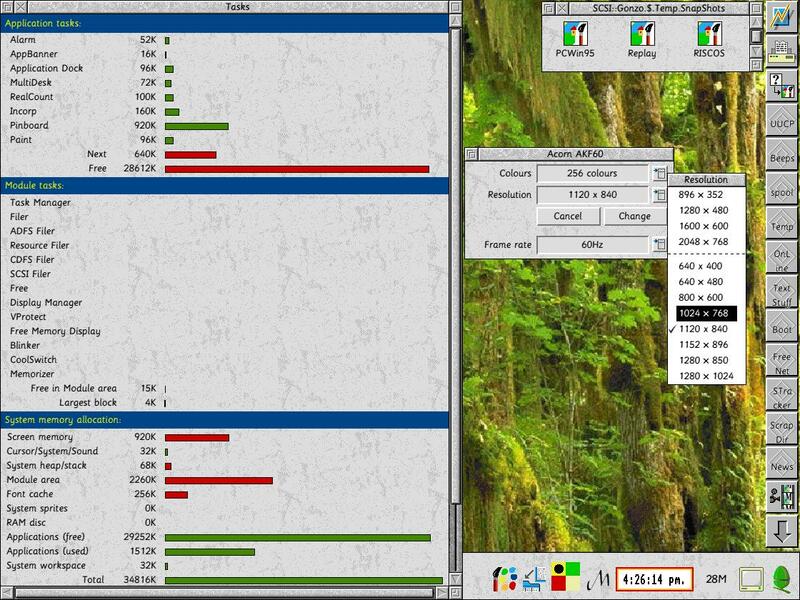 Even though RISC OS uses a co-operative model of multi-tasking the Filer operations are backgrounded quite smoothly. This allows a high degree of flexiblity as to how much RAM is given to the processor and which system resources are yielded to the card. For instance I have about four different configurations that choose a mix of screen resolutions and decide whether the serial port is given to the PC card. The physical hardware of a PC is emulated through a software frontend which handles translating the BIOS calls, and selected hardware ports, into something RISC OS understands. While in no way does this approach provide the equivalent performance to a top end PC it does provide quite acceptable performance allowing the more casual PC software user easy and convenient acccess to DOS/Windows software when required. Here we see how RISC OS provides management of the System resources. The large memory allocation and task handling window is accessed from the green Acorn icon and the smaller resolution, colour depth and frame rate windows is provided by the TV screen icon. Both icons being to the far right of the aforementioned icon bar. The memory settings are transient, and only apply for this session of the machine running. To permanently effect change another system tool is provided that commits the change to battery backed CMOS RAM which then becomes the permanent settings for every session of the machine. Mostly however this window doesn't need to be adjusted, most system areas will grow as required by the demands of the applications you run. However if RAM is tight, it can be convenient to check here to see if certain areas are now larger than required and can be shrunk in size to increase the free RAM pool. Video memory, when not required by the display system, is transparently shared as regular memory, making extra RAM available when you are not using high colour, high resolution screen modes. When switching screen modes if the required VRAM is actually in use by applications, and enough DRAM is free, then the VRAM will be transparently switched with DRAM as required preventing you from being locked into lower resolutions by an unfortunate sequence of memory allocations. Unlike many OSes, although this is starting to change, the screen resolution can be changed on the fly quite easily and all the applications and desktop adapt to the new screen mode. This means many RISC OS owners tend to favour running in a lower colour depth, and often resolution as well, in general - switching to a higher one as circumstances demand. For myself I favour an 1120x840 resolution with 256 colours for most tasks. Due to VRAM limitations 24 bit colour requires a drop to 800x600 pixels which is a little cramped for the majority of what I do with my machine. Again being able to chose the resolution and colour depth required so flexibly is something that helps in both time savings and ease of use. Windows 95 users are begining to get that flexibility with the PowerToys extensions to the OS but as yet that tool still isn't as flexible as our Display Manager. Finally, for comparison purposes, here is the default desktop provided by RISC OS. Everything you see has been sourced from ROM (and I mean everything Paint program, outline fonts, icons - the works). I have switched the desktop font from Sassoon.Primary, my normal font, to Trinity.Medium which is both the default font and one of the ones provided in the system ROM. If I hadn't done this the picture would have shown the older bitmapped font that the system provides when it can't access the specified outline font. But that font is ugly and definitely not anti-aliased. Thus concludes this brief look at RISC OS. 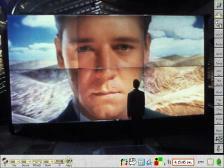 While I have waxed lyrical about RISC OS it is worth noting that the OS does have it's faults. The filing systems are not fully re-entrant preventing proper task-blocking on filing system operations, many people dislike co-operative multi-tasking with a vengance and there are curious gaps in functionality in the OS. Along with a host of other quibbles and complaints. However for an OS put together in the late 1980s by a fairly small programming team it has proved a quite remarkable achievement. And yes while it has faults, and what OS doesn't?, it is my opinion as a long time user of it that the advantages of the OS well outshine the detractions. Combined with the many tweaks to the user interface that it features RISC OS, for me, makes using the machine a pleasure rather than a chore. But then, I am a long time supporter of Acorn and it's machines. 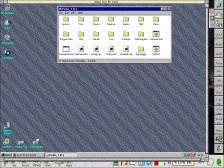 Anyhow, I hope this has given you a reasonable idea of what RISC OS looks and feels like. If you want to know more, then click on the Feedback link and let me know.